CHILDLIFE 총 9개의 상품이 있습니다. 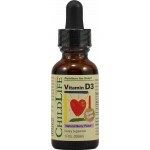 [해외] 차일드라이프 비타민 D3, 천연 베리맛 (115회분) Childlife Vitamin D3 Natural Berry - 1 fl. oz.